Agriculture Minister Dr. Leslie Ramsammy this morning witnessed the harvesting of first batch of carrots and beets from demonstration plots at the Guyana School of Agriculture (GSA) and the National Agricultural Research and Extension Institute (NAREI). This initiative by the Ministry of Agriculture is geared at intensifying its diversification programme of non-traditional crops all with the aim of reducing the country’s dependence on the importation of key commodities. Presently Guyana imports about $200M worth in Carrots and Beets\. The Ministry of Agriculture’s aim is to end importation of Carrots and Beets by 2020. Today’s event came on the eve of the Minister Ramsammy reiterating the call for countries within the region to use Guyana’s achievements as a model to follow and to advance agriculture to another level. The entities as part of its work programme to further develop the sector through research and expertise sharing embarked on the planting of a number of non-traditional produce all of which have since been successful. Among the crops currently grown at the two agencies are garlic, carrot, turmeric, ginger, chick peas, English potatoes and beets now being a new addition. 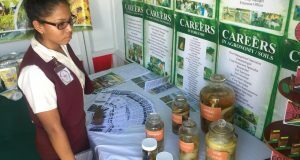 Farm Manager and Lecturer, Guyana School of Agriculture Bissessar Chintamani today underscored the importance of growing non-tradition crops. 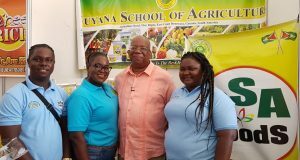 He added that while much research has been done at the level of the Guyana School of Agriculture through assistance from NAREI the end produce has been a success. He called on farmers to tap into the pilot projects noting that through assistance from the GSA and NAREI Guyana can produce the said commodities on a large scale basis. “Thus far, we have not encountered any major agronomic problems. The varieties tested have had great success in terms of yield but we are yet to test other varieties….. This programme will go a very far way in addressing commercial agriculture as it has since been proven feasible,” he said. The demonstration plots of carrot at GSA and NAREI started in February with the impetus from the Minister of Agriculture who charged the management of the entities to get involved in sound applied research hence the demonstration plots of the produce. Dr. Oudho Homenauth, NAREI’s Chief Executive Officer stated that while the traditional sectors have been the backbone of Guyana’s economy there has been a need to push for the advancement of non-traditional crops to give stakeholders better chance of increasing their investment returns. He noted that the introduction of such commodities can significantly assist in building the capacity of farmers especially those on a small scale level which will encourage the players to get more involved in diversification. Meanwhile, Agriculture Minister Dr. Leslie Ramsammy spoke of the huge food import bill noting that such will only continue if there is no seriousness about agriculture in the region. As such, Minister Ramsammy committed to ensuring that the sector continued to implement several such initiatives which are aimed at further developing new areas for cultivation. Significant achievements were made over the years as it relates to improving services offered to farmers to support further agricultural development hence the two entities pushing to have such projects advanced. “We will continue to ensure that such projects are further propelled and through assistance from NAREI and GSA the country will continue to boost its non-traditional crop sector…significant research are being done at the level of NAREI to ensure that farmers can tap into the production of additional such crops,” Minister Ramsammy said. To ensure that farmers receive the much needed support, the Ministry of Agriculture has embarked on an revamped extension services programme incorporating new initiatives that included training of farmers/residents and extension officers, the development of several Farmers’ Manual as a form of technical assistance and the completion of its Vision 20/20 strategy which serves as a model for which the sector will follow. Government has recognised the potential for other crops in the development of the country and as such has been channelling substantial amounts of resources to provide the necessary infrastructure, technical assistance and training to equipment farmers with necessary skills to explore and venture into new opportunities in the agriculture sector.